Electrician Jesse Sullivan lost both his arms after receiving an electric shock at work, and thought he would never again lead an independent life. 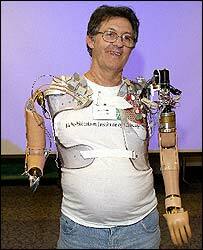 However, scientists at the Rehabilitation Institute of Chicago attached a unique "bionic" arm to his left shoulder. This artificial arm is directed by his own brain. Surgeons dissected the four major nerves that once went down Mr. Sullivan's arms, and placed them on his chest muscles. The nerves grew into the muscles, which allows him to direct his new arm through his own brain impulses. Incredibly, the arm allows Mr. Sullivan to shave, put on socks and glasses, and work in the garden. Even tasks like opening a jar and throwing and catching with his grandchildren are now possible. Dr. Todd Kuiken, Director of Neural Engineering Center for Artifical Limbs at the RIC, stated that this was the first time a nerve-muscle graft had been used to connect an artificial limb. In his 1972 novel Cyborg, author Martin Caidin explored the idea that someone who lost their limbs could actually have them replaced with prosthetics that would become a part of their bodies, and would be directed with the same electrical impulses originating in the brain. This novel was, of course, the basis for the well-known television series The Six Million Dollar Man. Thanks to Joel Jackson for the tip on this story.